On the 14th June 2014, Olaf Kerr took part in Co. Wicklow's ever popular mud obstacle course 'To Hell and Back'. Olaf endured a 12.5km run over a course that has been described as one of 'Ireland's toughest physical and mental endurance challenge' and all in aid of PIPS Newry and Mourne. Olaf would like to thank all those people who sponsored him and helped him raise a terrific £484. Likewise, PIPS Newry and Mourne would like to thank all those sponsorships for Olaf and for Olaf for taking part in an event for our charity, we appreciate all your efforts. 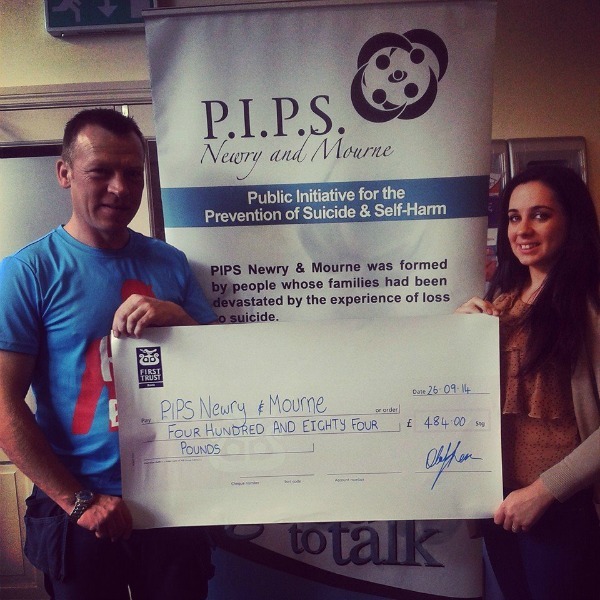 Pictured below is Olaf Kerr presenting a cheque of £484 to PIPS Newry and Mourne Laura McGuigan.